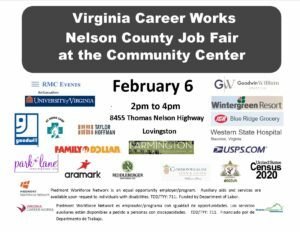 Virginia Career Works will be presenting a Nelson County Job Fair at the Nelson Community Center, 8445 Thomas Nelson Highway (across from the Library) on Wednesday February 6 from 2PM – 4PM. Employers include University of Virginia, Wintergreen Resort, USPS.com, Aramark, Goodwin William Staffing, and many more. Piedmont Workforce Network is an equal opportunity employer/program. Auxiliary aids and services are available upon request to individuals with disabilities. TDD/TYY: 711. Funded by Department of Labor. Piedmont Workforce Network es empleador/programa con igualdad de opportunidades. Los servicios auxiliares estan disponibles a pedido a personas con discapacidades. TDD/TYY: 711. Financiado por de Departmento de Trabajo.